I learned an important lesson last week… drawing and talking to an audience at the same time is really freaking hard. Also I swear a lot when I’m nervous. 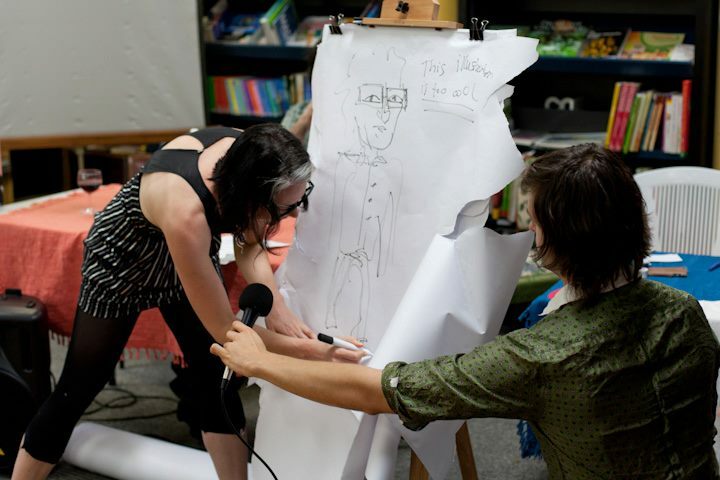 At Smith’s Alternative Bookstore I participated in a debate ‘We Got to Get Out of This Place’ for the You Are Here festival as organised by Scissor Paper Pen‘s Rosie Stevens. On my team: BMA editor Julia Winterflood and FunMachine frontman in gold hotpants Chris Endrey. We had to argue that Canberra is good for arts, that you don’t ‘Got to Get Out of This Place’ to get somewhere. For whatever reason I decided not to prepare any real speech at all and also to ‘live draw’ my arguments on ripped up butchers paper. Watch the disaster unfold before your eyes, it is kind of hilarious but also something I wish I’d thought about in a little more detail before I did it in front of a giant squished up crowd in the stinking hot summer. Also please watch Chris Endrey save the day and go back and watch Julia Winterflood start it all in style. Phew! We WON! Debate: We Gotta Get Out Of This Place Part 2 from You Are Here on Vimeo. Ironically ten minutes before this debate started I posted my application to the Centre for Cartoon Studies in Vermont, which I think you will find is not anywhere near Canberra. ← Comic book nerd success!